From left, Assemblywoman Sandy Galef; Ossining Village Trustee Quantel Bazemore; GDC Founder and Principal Martin Ginsburg; County Executive Robert Astorino; 3 Westerly Bar & Grill owner Jeremy Casilli and Ossining Village Mayor Victoria Gearity. OSSINING—Ginsburg Development Companies, along with county and village officials staged a ribbon cutting on June 1st to commemorate the official grand opening of 3 Westerly Bar & Grill, a new nautical-themed restaurant located at GDC’s recently completed Harbor Square luxury rental complex on the Hudson River waterfront. 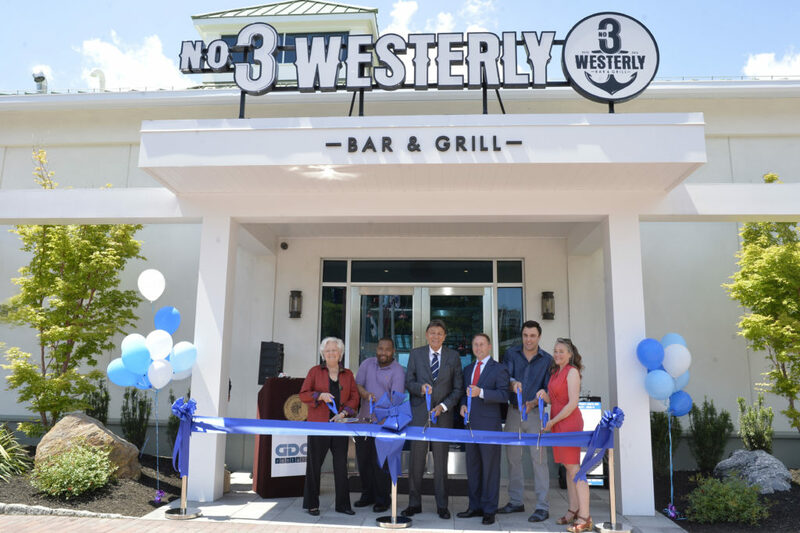 “Today’s grand opening of 3 Westerly Bar & Grill represents the final stage of our Harbor Square development which has transformed a former industrial site into a thriving mixed-use residential community with a public park and riverfront promenade. With the addition of this exciting new restaurant, people can enjoy first-class cuisine while experiencing the timeless beauty of the Hudson River,” said GDC Founder and Principal Martin Ginsburg. The grand opening of 3 Westerly Bar & Grill represents the completion of Harbor Square, a $65-million mixed-use luxury rental complex featuring 188 luxury rental apartments, a new public park with children’s playground, waterfront promenade with monumental sculptures and a dock that serves the NY Waterway Haverstraw-to-Ossining commuter ferry. At press time the development was 90% leased. Housed within a free-standing lighthouse, the 300-seat restaurant is operated by Jeremy Casilli, a restaurateur whose other venues include TriBeCa’s AOA Bar and Grill, Pier 115 in Edgewater, N.J., and Soho and Tribeca Grand Hotels. 3 Westerly Bar & Grill’s main dining room seats up to 100. Its main bar, which features a black granite bar surface, raised-booth seating with walls adorned with HD TVs, can accommodate up to 75 patrons. Under the direction of award-winning Executive Chef Dmitri Petriakov, formerly the executive chef at B.L.T. Prime in New York City, 3 Westerly Bar & Grill offers a wide array of dining options with a pronounced seafood emphasis. The restaurant also offers a full-service outdoor beer garden and sunset terrace capable of entertaining up to 125 guests. There is also a private dining room lit by nautical rope chandeliers that seats up to 75 guests.